Provider of professional lighting support and grip equipment. 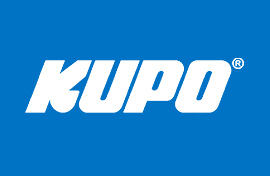 A leading manufacturer of professional lighting support and grip equipment, KUPO has established a strong reputation for quality and innovation. We hope that through this site, we can offer our customers more detailed information and service. The success of KUPO Grip is a result of our commitment to provide the best products and service to those who work tirelessly behind the scene of motion pictures, television, and photography. LIKE WHAT YOU SEE? GET IN TOUCH WITH ME.